Cities Connection Project | LES CORTS HOUSING FOR YOUNG. BARCELONA. There is a plan to build three residential buildings for young people in the plot classified as 10hj, with a total program of 48 homes. The placement of these three blocks seeks maximum adaptability to the existing topographic terrain, therefore the heights and floors will vary according to position and level. We propose to minimize the building height facing Albarran street to adapt to the previously built environment and accumulate the maximum heights in the interior West lot. 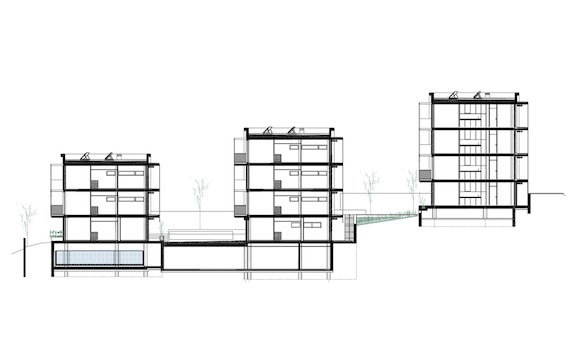 The buildings variations in height are to allow the entrance of sunlight and better panoramic views to the flats positioned in the back, as well as to allow the placement of a green space for optional gatherings in the middle of each block. 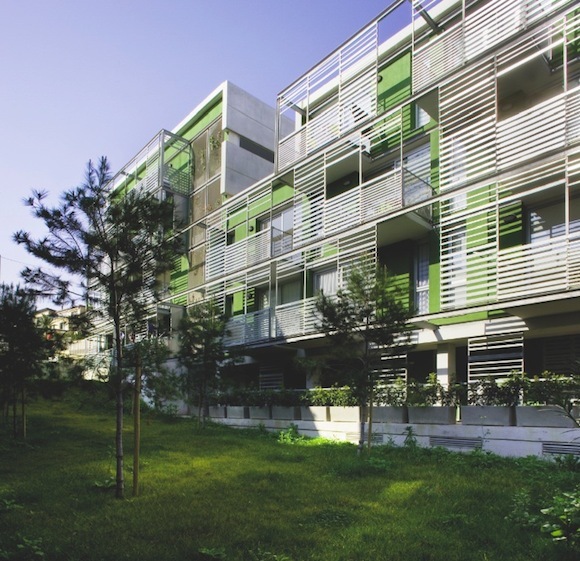 The southern facing position of the buildings ensures a good orientation to all homes. The housing access is organized in walkways accesible from a central comunication area or stairs distributed in each level. The stairs in most cases are open to the outside with the exception of the main entrance on the ground floor. The urbanization is structured in steps and terraces, around two areas of very different characteristics. One a green area consistant with the pre-existing topography of a mountain section. The other a paved urban square, located above the ground level of the street and which provides access to community services. In relation to sustainability. The project takes into account the incorporation of natural elements and resources as a priority. The chosen South-East orientation guarantees sufficient sunlight to all homes. Green as environmental protection. Rainwater is collected for each building and stored in two deposit tanks located in Block A and C to ensure the irrigation of the green community areas. The energy absorbed by the solar panels located on the roof of each block will be used for heating water. Galleries and overhangs facing south emphasize solar and thermal control. The layering structure of the building is a way to minimize excavations in the terrain and to control the environmental impact on the Green Area.